Chairman of the Board – Hallmark Cards, Inc.
Donald J. Hall is chairman of the board of the company founded by his father. He is only the second board chairman in the 100+ year history of Hallmark. 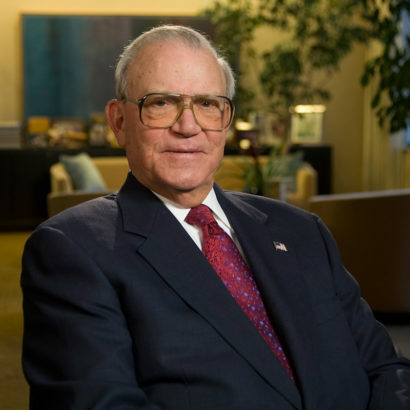 His period of active leadership, as president and CEO from the mid-1960s to the mid-1980s, was one of phenomenal growth for the company. He oversaw innovation in greeting cards, including launch of the Shoebox humor line and introduction of product lines for African-American, Hispanic and Jewish consumers. He also directed focus Hallmark’s network of independent Hallmark Gold Crown retailers, expanded the company’s reach into international markets and envisioned the potential to move into new product lines such as Hallmark Keepsake Ornaments. He led an initiative to codify Hallmark’s beliefs and values to ensure that basic principles were in place to guide decision-making as the company grew and accountability spread more widely. He also sets the example of community service and corporate citizenship. His love for the city that has helped the company flourish has been felt – most often in the behind-the-scenes roles he favors – in virtually every major civic initiative undertaken in Kansas City from the 1960s to today. Although he has stepped away from day-to-day responsibilities of the business, he continues to be actively involved in selection of Hallmark Hall of Fame production material and participates in employee recognition events and other activities.